The Hay Bale Studio backstage at Bonnaroo, outfitted by GC Pro. Photo Credit: TJ Hitt/Hitt Team Entertainment. 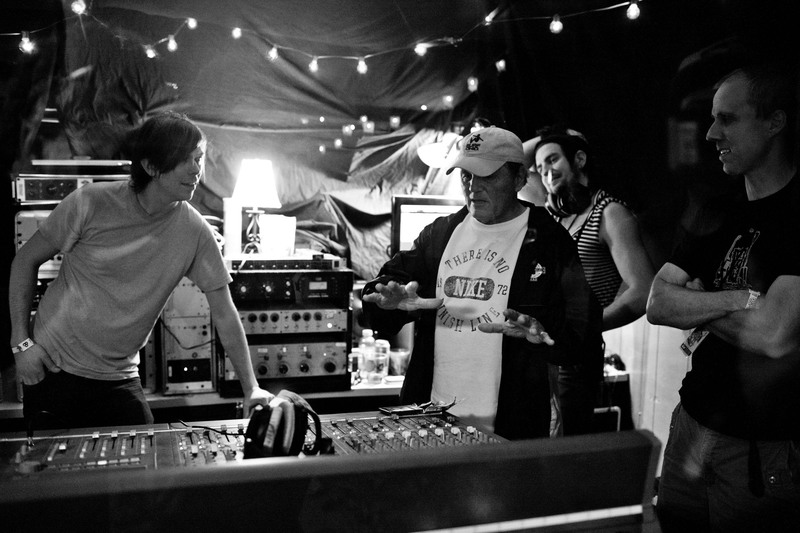 The Beach Boys’ Bruce Johnston tours the backstage Hay Bale Studio at Bonnaroo, outfitted by GC Pro. Photo Credit: Lij/The Toy Box Studio. WESTLAKE VILLAGE, CA, July 2, 2012 — For the eleventh year in a row, tens of thousands of excited music fans descended upon Manchester, Tennessee, for the Bonnaroo Music and Arts festival, held June 7-10, 2012. Bonnaroo 2012 was filled with memorable moments from its dozens of performing acts, including Radiohead, Red Hot Chili Peppers, Phish, Skrillex, Dispatch, The Roots and many more. Backstage, several of the festival’s acts were asked to lay down tracks in a purpose-built recording studio, outfitted with the help of Guitar Center Professional (GC Pro), the outside sales division of Guitar Center that focuses on the needs of professional users. The recorded tracks were mixed and mastered immediately and transferred to the radio tent next door for broadcast on radio stations nationwide. The studio, appropriately dubbed “Hay Bale Studio” after the dozens of hay bales positioned on the exterior for sound rejection, was again operated by Nashville’s The Toy Box Studio, and Toy Box’s producer/recording engineer Lij was at the helm for the sessions. The whole backstage studio/radio area was overseen by Asheville, North Carolina-based Music Allies. In the weeks leading up to the festival, the studio’s gear equipment list was compiled by Lij, his assistant engineers, and GC Pro’s Nashville-based Senior Account Manager Chad Evans, who was also on site along with other GC Pro personnel. Among the gear supplied by GC Pro were Burl converters, Slate Pro Audio Dragon compressors and Fox Mic Pre's, an Avid HD Native system and microphones from Royer, Mojave and Shure, among other equipment. All in all, 40 of the festival’s artists recorded nearly 100 tracks in the studio, including The Alabama Shakes, Feist, Young the Giant, Umphrey's McGee, Two Door Cinema Club and many more. The schedule for each session was fast-paced, leaving room for a quick setup and soundcheck leading up to first-take recordings of three songs, before each act was guided to the interview booth, also in the “Hay Bale Studio” trailer, to make room for the next act in the tracking room. Within an hour, the performances had been mixed down to two tracks and prepped for broadcast from the radio tent next door. Approximately 45 radio stations nationwide featured these “Bonnaroo sessions” over the weekend. The multi-tracked sessions were also preserved and archived, as in past years. 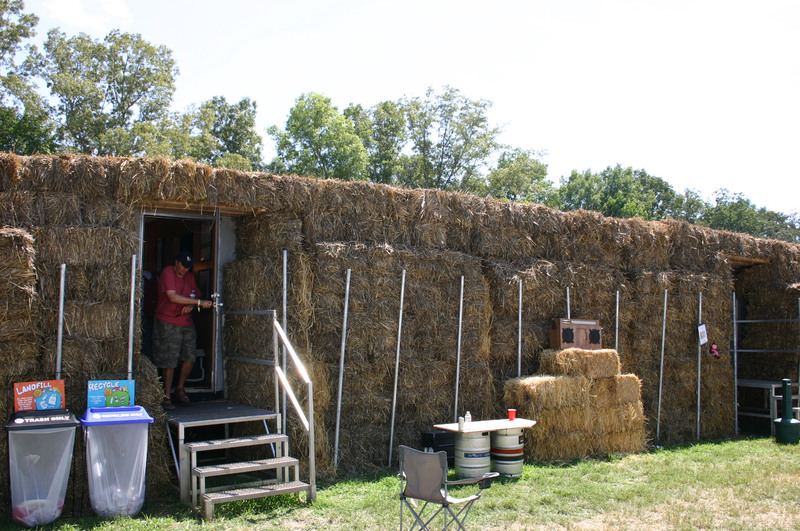 Photo Caption: The Hay Bale Studio backstage at Bonnaroo, outfitted by GC Pro. Photo Credit: TJ Hitt/Hitt Team Entertainment. Photo Caption: The Beach Boys’ Bruce Johnston tours the backstage Hay Bale Studio at Bonnaroo, outfitted by GC Pro. Photo Credit: Lij/The Toy Box Studio. Guitar Center is the leading United States retailer of guitars, amplifiers, percussion, keyboards and pro-audio and recording equipment. Our retail store subsidiary operates 229 Guitar Center stores across the United States. In addition, our Music & Arts division operates 101 retail stores specializing in band and orchestra instruments for sale and rental, serving teachers, band directors, college professors and students. We also are the largest direct response retailer of musical instruments and related products in the United States through our wholly owned subsidiary, Musician’s Friend, Inc., and its catalogs and owned or operated websites. More information on Guitar Center can be found by visiting the Company’s website at www.guitarcenter.com.